This badge was issued to Aline Bossi Bossi Pereira da Silva on 17 Feb 2019. The earner has acquired knowledge of applying Enterprise Design Thinking and its value. As a Practitioner, the badge earner finds opportunities to try it out in their every day work. Able to discuss and apply basic Enterprise Design Thinking concepts. Able to identify opportunities to apply Enterprise Design Thinking. 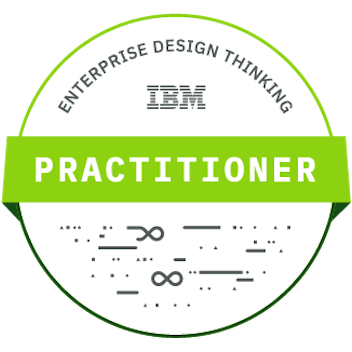 EARN: Complete the online Enterprise Design Thinking Lessons, or IBM Approved course equivalent. You may also earn this through intimate in-person training and assessment. Contact IBM to learn more at designthinking@us.ibm.com. Enterprise Design Thinking is IBM's approach to applying design thinking at the speed & scale a modern enterprise demands. It helps our teams not only form intent, but deliver outcomes - outcomes that advance the state of the art and improve the lives of the people they serve. This person has completed the Enterprise Design Thinking Practitioner Online Education Program. Their achievement was validated by IBM Design Global through course completion and real-world application, and against the criteria set by the Enterprise Design Thinking Center of Competence.